This winner of this giveaway, according to the random number generator, is PK Sews! Congratulations! Window Boxes is a fun, modern design that I pieced this summer for Quilters Newsletter Best Modern Quilts Issue. I'm so excited to be able to share it with you here today as part of the last day their blog tour, for which they have generously sponsored a giveaway of both a magazine and a Jolie fat quarter bundle by Anna Griffin! Some of the larger wonky windows sport just a bit of appliqué! Window Boxes is sewn in a combination of my "Bella" and "Bonjour, Mon Ami" lines for Blend Fabrics. I used Aurifil thread for the piecing and appliqué and Warm and White batting. My good friend Cherry Guidry of Cherry Blossoms Quilting Studio, quilted the fun floral pattern. To enter the giveaway of a copy of the magazine and the Jolie fat quarter bundle simply leave a comment telling me about a quilting project you are currently enjoying or are excited about starting. Deadline is tonight (Friday the 17th of January) at midnight. One entry per person please. And be sure to stop by Quilters Newsletter and another designer on the tour, Janet Jo Smith (a little bird told me it was her birthday today so be sure to wish her "happy birthday"), for more chances to win prizes! Happy quilting and have a great weekend! P.S. Please join me on Instagram at "amandamurphydesign"! I'm starting a baby quiilt for my sister in law. She's looking for a baby since 2009 and she lost one at the third month one year ago. So we all ara so happy! Top violet (she loves that colour!) and swwt little monhesys.. I am working with lovely Kona and your book! ;). What a sweet quilt! I think the addition of those funky appliqued flowers and the flower quilting were just the right touch. I am working on basting my Modern Charm quilt today and preparing to write a blog post on pin basting using a quilting frame. Thanks for the generous giveaway! Your quilt is gorgeous. I love the colours. Only yesterday I found out I was going to be an aunt again (it was very unexpected) so I have been busy looking at patterns for a baby quilt! Thanks for the lovely giveaway. This year I'm making a baby quilt and a wedding quilt - both need to be finished by June!! I love your fresh design. I am currently finishing Lori Holt's Row Along quilt. I know, I am a year late. Having fun with it. I would love to win that beautiful fabric and the magazine so I can try your cute pattern. I am currently working on a black, gray and white quilt called Labyrinth Walk that was featured in Quilt magazine last spring! I am a brand-new member of the Portland Modern Quilt Guild and am exited to get started on their project for the year, a medallion quilt. I just finished a garden fence quilt top and it's backing. Now I just need to "baste and quilt". Two simple words but so much work! Gorgeous quilt! I am working on Midnight at the Oasis, a pattern by Jen Kingwell. It is a medallion quilt and at the moment I am doing some hand appliqué and tiny churn dash blocks! I've been enjoying the blog hop with your book and Kona! All I've had time for lately is making blocks for the Block Lotto Blog. It's fun! Have a good weekend. I just mailed 3 baby quilts and now I am back to what I want to do. A couple of Cozy Quilt patterns. I love, love, love your quilt. Beautiful color choice! Just finishing up a cute quilt now for a baby boy. Next up? Who can choose? Maybe a BOM block or two, and I have a few new rulers I'm eager to try out! Just beautiful! I'm ready to get started on a batik jelly roll pattern that I've had for over a year... it's time to cut into that beautiful fabric! Thanks so much! How lovely! I am finishing up a kitty quilt for my niece and at the end of the month starting my first BOM w/ Thread Of Memory - an underground railroad quilt for my MIL. thanks! What a sweet quilt! I love the colors and the flowers here and there. I am excited to get working on my quilt I designed for the kona blog hop. Beautiful quilt! Thanks for sharing. I'm working on a quilt of my own design that I've named "Tube Time". The focal fabric I'm using looks like a television,thus the inspiration. I love your design! Thank you for the giveaway! Now that the Holidays are behind me, I'm going to start with your Modern Holiday book. I love to make Christmas quilts in January. Love your fabrics and books. I am leaving on a mission trip next week so I am busy sewing a few skirts and a carry on bag for the flight. Then when I get back I have a great niece and great nephew that I am making quilts for that need to be quilted and bound. My current personal project is working on continuing a robin quilt into a bed size top. I started making Economy blocks....even though I have about 15 unfinished projects...just can't help myself. I love Anna Griffin's designs, thanks so much for the chance to win! Beautiful quilt ! I am currently taking part in a sew along Good night Irene , should be fun . Thanks for the chance . I am working on a hexie quilt, Science Fair (Jaybird) and I HAVE to get it done! Love your quilts and the colors. Amanda, I am working on a Road to Oklahoma quilt right now, but can't wait to make a quilt from your book. What an adorable quilt! Love the applique flowers! Thanks so much for an awesome giveaway!!! I'm currently working on a few BOM's that just started up for January - Wishes Quilt Along, Pat Sloan's Globetrotting, Aurifil, Sugar Block Club, and two paper piecing BOM's - just a tad bit busy but I'm loving it!! Another beautiful quilt from you is always appreciated. The addition of the appliqued flowers is hits just the right note. You are such a huge talent rolled up in this tiny little bundle of a being. I'm looking forward to starting a dresden quilt for our king size bed, but a little intimidated at the same time. Just love the colors ad design of this quilt; sew wonderful!!! I'm watching your Craftsy class and would like to make one of those projects. So beautiful! I am currently practicing my fmq skills on a scrappy log cabin quilt. I've been at it a long time, but I finally feel like the end is near. I love the pattern Window Boxes and the color of the prints are lovely. I am trying to finish up 3project that don't require much work to complete, but a new selection is calling me at the same time. Thank you. I am working on a toddler quilt for my great-nephew. I finished his new brother's quilt & wanted to make one for him too. Thanks - love your quilt. This is a beautiful quilt! I'm working on the next blog hop, but I'm looking forward to making another one of your quilts. Love that book! I love the colors of this quilt. Awesome job. I started a block of the month quilt. scary as its my first quilt that I'll be doing. Learning curve for sure. Just before Halloween I found a shoebox of scrap Christmas fabrics that my mother in law had given me more than 20 years ago. I've been carrying around that box for that long, through moves to 4 different states. This was it, I said. I cut them into 1 1/2 inch strips and made a spiderweb string quilt with them. I used a solid yellow for the background, which makes loves stars between the spiderwebs. All I have left to do is attach the piano key borders and get it quilted. Then I'm going to send it to my mother in law for Christmas! I just love your design, it is so fresh and springy. I am in the middle of a double wedding ring, it is for a friend getting married in August. Thank you for the chance to win. I've been working on a Sew Along making Goodnight Irene. It's been fun and will be a charity quilt when I'm done. Your quilt is beautiful!! Thanks! I love this quilt. I saw the picture before the contest and just new that i'd be making it. I sure does have a spring-like feel to it. The addition of the flowers just 'made' the quilt. Your quilt makes me yearn for Spring, so bright and happy. I just received a bundle of pink fat quarters so am going to make a table topper for Valentine's Day. What a bright, fun quilt - love the color scheme. I'm starting a Smithsonian applique quilt kit that has hiding been in my stash. I came across it the other night looking for something to work on. Love the way you combine colors. Very refreshing. Finishing up a quilt for my granddaughter, the light of my life. lOVE WINDOW BOXES. I am going to be doing a Jo Morton group soon - yippee. Love your quilt. I just finished the binding on an old scrappy UFO. Next up is a tote for my sister's birthday and then another ufo that needs quilting. A quilt for my father and stepmom who have very cool taste and are pretty fun. Looking forward to having a fantastic, chic quilt to give them this year. Love your quilts & your two books! Thanks for participating in this blog hop & the giveaway. I would love to win! Love the colors and the applique! Currently working on a baby quilt of my own design, to use for testing out a different brand of a longarm machine. I'm loving the pastel colors! I love your quilts and your two books! Thank you so much for participating in this blog hop & generous giveaway! I would love to win!! Oh, Amanda, I love this quilt. The colors and the flowers make my hear sing. I'm going to start another heart quilt, so I can perfect the pattern a bit. Binding a baby quilt and quilting another one. I really like this quilt. I do a lot of Free motion quilting using flowers. I'm working on smaller quilts for my nieces. I'm excited to begin Noodlehead's Cargo Duffle today - it's such a great bag and will look good in any fabric, I'm sure! I love this quilt...the colors are vibrant and bright. I am currently starting a border of the month quilt through my quilt guild. I'm excited to start, your colors in your quilts have inspired me! Love your quilt! I am about to start a jelly roll quilt with camping theme. Your quilt is absolutely beautiful! I just ordered a bundle of Charlie Harper FQs and am trying to decide what I'll make when they arrive. I love this quilt. Beautiful! I am finishing the hand quilting on a small quilt for my daughter. I pieced it from some lovely batik squares I found on clearance at a local fabric shop. I hope to get it done before the end of January! I have started a new project with my mom who has dementia. She can sew strips together so we are starting a 9 patch block out of all sorts of floral fabric. Thanks for the giveaway!! LOVE the idea of mixing a fussy cut applique with traditional/modern patchwork. I am busy sorting and reorganizing my quilt fabric, etc. Seeing more of the modern quilting is getting me interested in starting a new section in my stash! Chance to win Fantastic! What a darling quilt! I love the applique! Thanks for a chance to win!! I just finished making a lap quilt using your Bella line. It is a lovely combination of colors. Thanks for the chance to win! Right now I'm hand piecing a Jinny Beyer pattern -- 4 blocks to go! I love your Window Boxes. I'm working on a quilt for my two Pomeranians. Girly material always catches my eye, but with a 19 year old son, I'm limited on the fabric I can use for him. With my two girl furbabies, I can use all the feminine fabric I can get my hands on. Thank you for the chance to win such an awesome prize! Your quilt is lovely and the colors are so cheerful! I'm currently working on a bed quilt for my niece who requested a tangerine/turquoise quilt to brighten her college dorm room. After finishing my last quilt back in Sept and then Christmas sewing - I am yet to jump back into quilting. I am having trouble deciding whether or not to finish one of the many tops that I have on the go or start a Pezzy Jelly Roll quilt by Busy Thimbles! I'm just about to start a quilt for a coffee table that I'm really looking forward to. Love the colours in your quilt. For the first time I am doing a mystery quilt featured in the Quiltmania magazine..because the designer is Di Ford..I am excited about it starting but also a little anxious as there is a lot of appliqué..but I thought I would challenge myself to work on something a little different for me this year..time will tell! Love the colors on your "Window Box" quilt! I just finished the Veranda bag by Penny and am going to finish a table runner before starting on another quilt. LOVE that quilt and it would be wonderful to win those yummy fabrics! Thanks! this quilt it beyond spectacular ! I would never choose those colors ; but I LOVE THEM ! :) I am working on a non quilting project right now ; to get out some donation bags on a deadline , however when they are done I shall bind a batik quilt that needs to get done for ME ! What a pretty quilt! I'm presently having lots of fun working on a nursery rhyme quilt for my little granddaughter. Beautiful quilt! I'm working on a star quilt by Terry Atkinson using the Sew Mama Sew collection by Sweetwater. I love all the text fabrics and the colors of red, ivory, gray, and black. Thanks for the great giveaway. I just finished up making placemats and a table runner last night. It is always a puzzle after completing a project...buy new, use stash, or finish a UFO. I love the flowers on your quilt! Very eye catching. I am working on finishing up last year's BOM's. :-o Thanks for the fun! I have a double bed size all 5" HST flimsy all ready to layer up. I like the quilt Window Boxes.. The colors are fabulous and I like the applique.I am working on UFO's and a block of the month quilt. Thanks for the opportunity to win! I like your quilt. I'm not a fan of greens/yellows, but I see this being made up in blue or purple/lavendar colorways. I'm hand quilting the last border on an "Autumn Baskets" wall quilt. It will be part of my guild's auction in March. I really do like it so it will be hard to let it go!! What a delight, thank you so much! I love your quilt! It is so spring-y! My daughter's favorite color is lime green and I made her a green quilt, but with black instead of white. She loves it, but I'm sure she would love yours more. By the way, the quilting is fantastic! Wow! 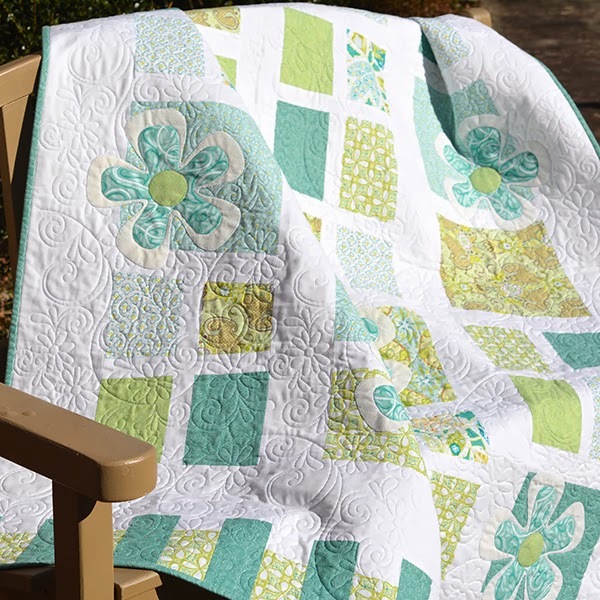 Spring indoors - on a quilt, what a wonderful idea! Love the colors and fun flowers. I am currently finishing a prayer quilt for a friends Grandson and am starting to cut out my Celtic Solstice to follow along with Bonnie Hunters mystery quilt. As usual I am a bit slow but getting there. Thank you for sharing your beautiful quilt. I'm excited about starting a baby quilt for my very first grandchild. Thanks! Love that quilt! I'm working on a chevron quilt using vintage sheets. I love the quilt colors! The magazine would be a great addition to my library. Right now I'm making some drawstring bags but plan to start my daughter's quilt soon. Beautiful! I am finishing up "Blue Ridge Beauty" designed by Bonnie Hunter, found in her book, "Leaders and Enders"
So pretty! I'm finishing up a tote bag and then excited to start a t-shirt quilt for my sister! I love that quilt! I'm currently working on a Tangelo quilt from Carolyn Friedlander, it's challenging but fun! that quilt makes me long for spring. I am working on some donation quilts which will go to preemies at our local hospital. Love your green and white block quilt! I'm working on a purple, white, peach shades quilt for donation to a college auction to raise funds for this college that I attended. Your quilt is beautiful - looks like spring, which is great as I'm sitting in snow. I'm currently working on a mystery quilt for an online guild. The last clue comes out tomorrow and I'm eager to see what I've been sewing. I usually have a couple projects going at the same time. I'm mostly working on a quilt for my grand daughter Katie, and the name of the pattern of the quilt I'm working on is named "Katie's Quilt". I saw a really cool youtube video today of a quilt I would love to make and it took all my will power not to start a new project today. Thanks for the chance to win and I enjoyed your lovely quilt and blog. Love the colors. I am working on an applique wall hanging, actually I am working on two! One I am quilting and the other I am hand stitching the applique down... happy days!! Love the Flowers and colors! Need fabrics with HEARTS, working on a quilt for Congential heart defect month. I'm getting ready to start a new star quilt. And I'm also working on a Christmas (for next year!) wallhanging. Congratulations on having your quilt in the magazine. I'm working on a Round & Round quilt pattern by Camille ROskelley. Doing it up in batiks with a gray background. So far, so good! Enjoy your weekend. I may just have to add a new quilt project to my list - your is lovely! I am finishing 8 quilts at the moment. Just need to be quilted now that my Christmas projects are done. Then I am looking forward to doing something fresh and clean looking. Your Window Boxes quilt is just what I have been looking for. I will be excited to make one for MY bed. Love your quilt. Just adding borders to a mystery quilt, making a small wall hanging and getting ready to start a baby quilt for my nephew's first child. And tomorrow is a quilt retreat so I hope to get it all done! I am working on a memory quilt for young lady who lost her mother when she was nine. The front side of the quilt is a t-shirt quilt of her sports and activities from grade school through high school (She graduates this year.). The back has a garden of hearts made from her mother's clothing. It is a surprise for her graduation from her cousin and his wife who have raised her since her mother passed. You can't imagine how honored I am to be a part of this project for her. On another note, your quilt is GORGEOUS. I absolutely LOVE it. it is easily my favorite modern quilt I've seen in a long time. Inspirational--thanks! Thanks for the chance. Your quilt i lovely! I'm working on Palace Doors and just love all your patterns! Love the quilt! I'm putting the finishing touches on a couple of mini quilts for my niece. I'm trying a couple of new technics on them. Thanks for the chance to win! What a gorgeous quilt! I'm in between projects. Trying to decide what I want to make next. I just found out that I am going I be a Grandma, 1st time to. So I will be starting to make baby quilts, one with polka dots for sure. I am currently working on a quilt for my son which seems like I have been doing for a lifetime. I am excited about doing anything different than this. Love that quilt! I would love a copy of the magazine! I just finished a Peanuts quilt for my husband who loves Charlie Brown. 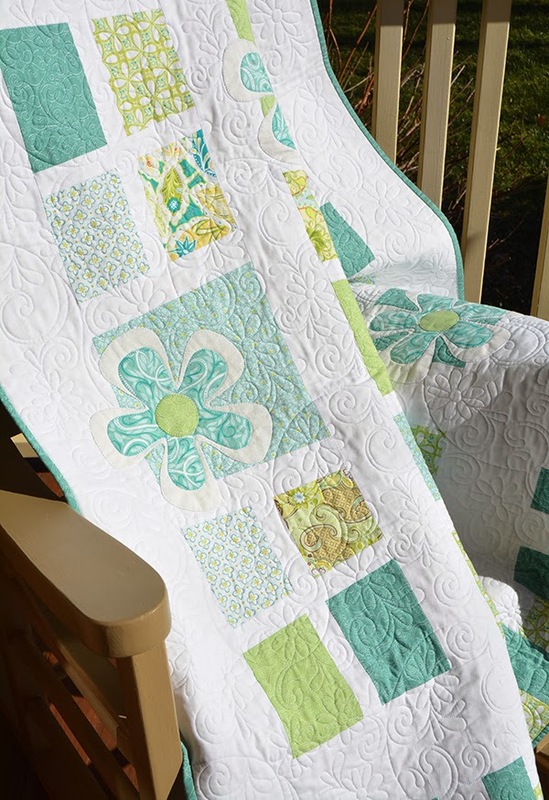 HI,USUALLY I'M NOT SO FOND OF GREEN QUILTS>BUT THIS IS GORGEOUS! JUST RIGHT-MAYBE MORE OF AN AQUA! I'M WORKING ON A CHRISTMAS TREE SKIRT FOR NEXT YEAR (I LIKE TO START ON MY GIFTS EARLY-LOL)THANKS FOR SHARING ON YOUR BLOG+THE GIVEAWAY! I am working on a baby quilt in greys and yellow for a little boy. Window Boxes is such a fantastic, fun quilt - love the soft colours! I'm excited to finish up the binding on a Jelly Roll Race that I made for my Mom and to also finish the piecing on a quilt I designed for my daughter. After that, I plan to start the cutting and piecing for my son's bed quilt. I love having so many projects to look forward to! (Speaking of which, I'd love to try making the "Lollipop" quilt you blogged about a little while ago.) Keep up the great work! Window Boxes is a spectacular quilt. I want to make my own version. I have visited your site often the last while as I have been following the Kona Sunrise/Sunset tour as well as the Quilter's Newsletter's tour. I always enjoy myself when I visit. Thanks for sharing your creativity and for offering a giveaway. I love the design, the applique, the color, and the quilting on this quilt! It all comes together to make something fresh and joyful! Thanks for sharing. Such a cheery quilt...definitely brightens your day in midwinter! It would be nice for non account folks to enter their email address without it being displayed to the public so they could enter the giveaway! This quilt is breathtaking -- your fabrics are so fresh and beautiful. I'm excited to be starting a baby quilt in the next few weeks. Baby Olivia has already arrived and is just waiting for a specially designed quilt to keep her warm. Love the pattern and fabrics. I am working on a mystery quilt and a BOM. What luscious colors! I'm making a quilt for our 4 year old granddaughter-little kitty panels interspersed with pieced blocks. Fun and colorful. Just finishing a red/white/blue quilt for my granddaughter's 21st birthday! Your quilts are just beautiful. So fresh and making me wish for Spring to arrive faster! forgot a url :) Also love the colors. I am a blue and green gal and the palette really calls to me. Love the design and color of your quilt. My next project is Bella's Garden. I have the material and just need to cut it. My sister picked it out and it's for her 65th birthday which is in August Thank you for the chance to win! 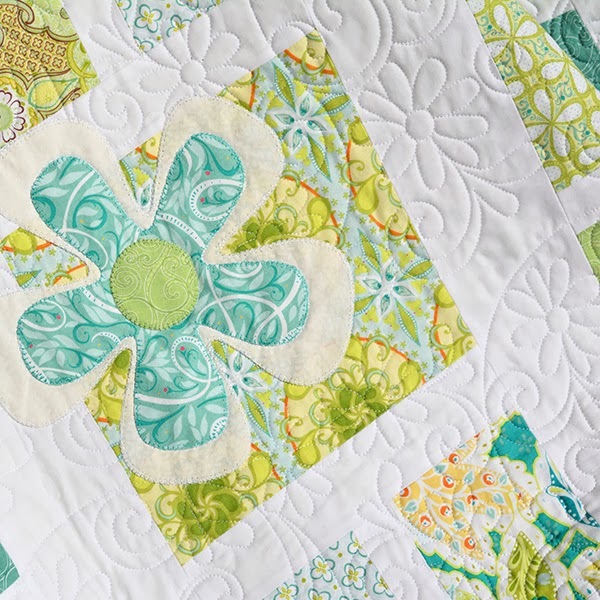 Love the bright, fresh look of this quilt. I am currently finishing up a BOM from last year. Just have to get the inner border and the last outer border put on and it will be ready for quilting! Then I will be excited to get back to hand quilting a BOM I started in 2005 and set aside for a while....I am almost done quilting the center then will only have the borders left to do. I am in the hand-quilting phase on a twin sized quilt for a dear friend having chemo. She's not doing well, so I'm trying to get it done fast. Amanda, the quilt is gorgeous! Your fabrics are so pretty and soft. I am working on a "Postcards from Hawaii" quilt. It is a fun quilt to work on in January in Boston. What a beautiful quilt! I love the colors; they make me "think Sprig" in the midst of a snowy Winter. I'm excited to be working on a quilt for my son and his future wife. The pattern is "Three in a Box" which reminds me of a modern wedding ring quilt and I'm using yellow, gray, and white fabrics. Love your quilt. The fabrics used showed off the design. I am trying to get started on some I Spy quilts for my 3 little grands. I just need a day without any other interruptions! Beautiful quilt!! I am taking a class at my Joanns store for a 9 patch with scalloped boarders. I am eager to learn this next step in my quilting. Thank you for sharing your quilt. Love, love, love your Window Boxes quilt. After seeing all the modern quilts on the blog tour I'm planning on making one very soon to get out of my comfort zone. Currently I've ventured into EPP, I'm almost finished with a babydoll hexie quilt for my granddaughter. I finished my submission to our Guild's Quilt Show Challenge. It's a landscape art quilt of California's State Park Mono Lake. I love the beautiful pastels in your quilt. It is one of the prettiest quilts I have seen. I am working on a red and white Christmas quilt which I couldn't quite finish this year but should be more than ready for next! I love your quilt with the appliquéd flowers, and the color is beautiful!! I typically do traditional appliqué but am really getting inspired with the new modern quilts and what we can do with these gorgeous colors!! Which WIP do you want to hear aout- I current have a Swoon going, a Penny Patch and the Riley Blake challenge. I need to get moving. A fun quilt! I love the colors, and the quilting! Love the quilt and the quilting. I am not starting a new project at the moment but instead finishing up several based on craftsy classes I have enrolled in. I am trying to learn to free motion quilt on my domestic machine and I am LOVNNG it! I am just learning to quilt. I happened to pick up a copy of Better Homes and Gardens Quilts and More and saw your Holiday Sampler. It is so beautiful! I sew clothing and decided why not try!? So I bought all the Holiday Boutique fabric I could find and it's a good thing I couldn't find it all because after browsing quilt blogs and reading quilting magazines, I realized I would have ruined your beautiful fabric. 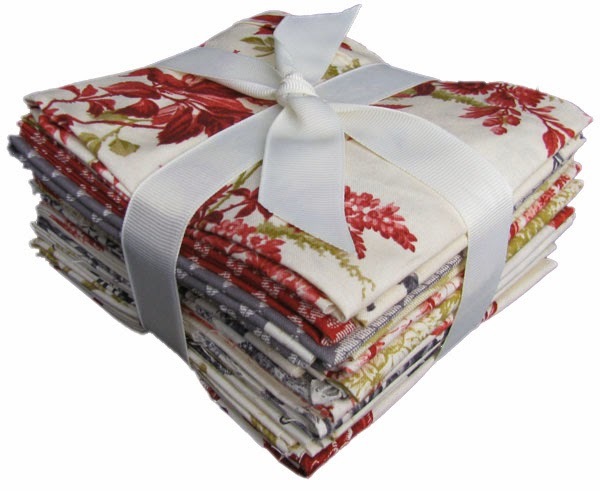 I am currently taking several Craftsy classes and can't wait to start on my first quilt!!! I'm working on several projects at once (sound familiar?). I hope to finish a simple 4-patch scrap quilt which was a challenge from a quilt group to which I belong. I love your quilt, but perhaps won't make it...your quilter did a delightful job, accents positively to your work...my next work: for,this whole year is to finish up UFOs. A very green sort of thing to do, don't you agree? So love this quilt, great modern pattern lovely crisp cool summer colours. I'm just getting into machine appliqué and am finishing my first project using this technique. Next on the agenda is a quilt for my soon-to-be-born granddaughter, also machine appliqué! Thanks for the chance to win! I am currently working on a Charity Quilt for our Guild Cuddle Quilt program using stash fabrics. Love love love the colors and the design! Thanks for the inspiration! Beautiful quilt! I currently am working on a 4th of July pillow so I can start my long wanted kindle bag orgainzer. I'm finishing some bee blocks from early last year. birthday, I am sure I do not have to tell you about trhkng to find time for projects! Wake Up to Kona is Here!